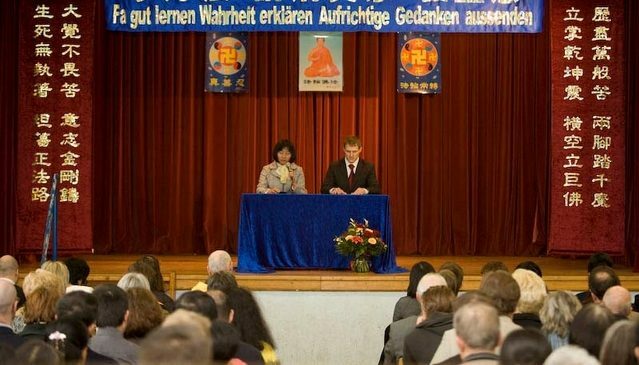 On December 28, 2009, a Falun Dafa Cultivation Experience Sharing Conference was held in Karlsruhe, Germany. Practitioners shared their experiences of looking inward, cooperating with fellow practitioners and harmonising with family members. Many attendees expressed that they benefited from the speeches. Ms. Cheng said: "I was deeply touched. I learned that other practitioners have bigger difficulties than I do, but they passed through them with solid righteous thoughts. I asked myself 'why cannot I do it.' One practitioner's sharing made a deep impression. She memorised the Fa and always sees problem based on the Fa. I was encouraged," she said. Another Chinese practitioner said: "A practitioner who is an editor of Dafa website talked about how to get rid off the attachment to showing off. I learned something from him. I have the same problem. When other practitioners criticise my articles, I get mad. From that speech, I learned how to be objective and respect an editor's revision of my article." Several practitioners talked about looking inward. Mr. Zhao said: "The speeches helped a lot. Most of them talked about looking inward. They don't complain about the fellow practitioners and try their best to cooperate with them. Although nobody is perfect, practitioners don't complain. They look inward and try to cooperate." Vironica, a German practitioner expressed that practitioners' sharing help her realise that she has also been influenced by the communist culture, since she grew up in East Germany. She said she was brainwashed by the violent culture. Ms. Zheng, an editor of the German edition of the Epoch Times newspaper, said: "From a practitioner's sharing, I realized how important sharing with others is. That practitioner, who works for the Epoch Times, had encountered some difficulties, which other practitioners at the newspaper office also had. He passed the test and shared his experiences with others so that other practitioners didn't get trapped in this same problem, which help the newspaper's development. So, as a coordinator, I will arrange more time for sharing during our regular meetings, which will help us a lot." Petra shared her experiences selling ads for the German edition of The Epoch Times. Initially she had a very negative impression of sales. She thought it seemed as if she was begging others or she used rhetoric to convince others to take money out of their pockets. She was able to sell only a few advertisements, but was far from generating enough income to sustain the newspaper. She found it very difficult, but reached a turning point just prior to Christmas this year. The German Epoch Times and the Chinese Epoch Times cooperated and published a Christmas Special Issue. For three weeks, sales staff in the two media outlets cooperated for the first time and achieved unprecedented success. Petra overcame her laziness, and worked full-time, even overtime, selling ads. She was no longer disheartened, even when she was harshly rejected. She would proceed to visit the next business without hesitation. She believes that her work for the Epoch Times will become better and better, and will be more effective in saving people. Ms. Huang told of how, through writing articles, she looked within, let go of attachment to reputation and eliminated Chinese Communist Party culture. Practitioners pointed out that some of her articles lacked compassion. While looking within, she detected her attachment to reputation. She hoped others would read her articles and liked to hear praise. She realized that this vanity and attachment to reputation would be naturally reflected in her articles, and others would notice it. How could such impure articles save people? She also detected another problem that others have often pointed out, but she had not yet realized: the element of Party culture, being inconsiderate of others, being critical of others, and containing factors of challenging others. A Chinese woman who has practised Falun Dafa for three years shared how she looked within and let go of her competitive mentality. She then was able to resolve the problems in her family with tolerance and patience, so that she could step forward to validate Dafa. While making preparations for the Shen Yun performance, she let go of her desire to be important in others' eyes, vanity, and selfishness. She had only one single thought, hoping to save every predestined life. A practitioner named Judith from Austria participated in an activity in Budapest, Hungary in October when China's vice president visited. She recounted an experience when several Western practitioners and a Chinese practitioner entered a snack bar to have a meal. Six Chinese plainclothes bodyguards rushed in. Two of them proceeded to sit at the table where the Chinese practitioner sat, without asking for permission, and the remaining four stood along the wall, attempting to frighten the practitioners. The two bodyguards talked with the Chinese practitioner in Chinese for a while, and then the practitioner took out a copy of Zhuan Falun, and found a certain paragraph and read it to them. The two agents listened to her for a while and then left with the others. Judith thought that the Chinese practitioner used her compassion to eliminate the evil. On the way back from Budapest, practitioners came across the Chinese delegation again. When practitioners' car slowly drove past the delegation's motorcade, the practitioners unfurled a banner that read "Falun Dafa is good". A practitioner who just began practising Falun Dafa two years ago shared his experience. When he went to work at a new job in early 2009, he gave each office a handmade paper lotus flower, thus, he naturally talked to his colleagues about China, human rights and Falun Dafa. Several of his colleagues wanted to learn Falun Gong, so he arranged once a week to do the exercises together with them. For the past six months another practitioner and he have continued doing the exercises every morning in a park. Ms. Wang shared her understanding of "unconditional cooperation" from her experience of raising her child. While she was writing articles for The Epoch Times, her two-year-old child often came to ask her to accompany him to play. At the beginning, she always tried to get her child go play on his own, so that she could concentrate on writing, but she had never succeeded, ultimately she was unable to complete her article. Later on, she completely let go of her own things, and was engrossed in accompanying her child to play. She found that when she "unconditionally cooperated" with her child, her child could start playing on his own within ten minutes, so she could go on with her writing. The result was unexpected for her. While cooperating with practitioners, in particular, when practitioners have attachments, she is likely to look outward, and unable to unconditionally cooperate with the practitioners. Her experience with her child makes her realize that she has a distance to go from the Fa's requirement of her in terms of cooperating with practitioners. Ms. Si is in charge of content for two pages of the Chinese edition of the Epoch Times newspaper, and has experienced a process of going from looking outward to looking within. At the beginning, when the writer of an article made mistakes, she complained a lot. She always found fault with others. For example, this writer was unable to submit articles on time, and that one was not careful. She wondered why this practitioner did not make any improvement after having worked for so long. That practitioner could not even get basic data correct... She was bitter and tired. Later on, she realized that she had been looking outward. Since then, when she found practitioners' mistakes, she no longer complained, or blamed them, but patiently pointed the mistakes out. As a result, she noticed that the practitioners improved, and she did not need to edit the articles much. Ms. Yang shared about her change of understanding after listening to the recording of the witness who witnessed the entire process of live organ harvesting. When she read news about the persecution of practitioners before, she had often thought that they were persecuted because they had attachments. But this time, when she heard of an episode in the recording, when the military surgeon cut the practitioner's chest with a knife, the practitioner who was not anaesthetised, shouted loudly, "Falun Dafa is good!" she was deeply shaken. She thought the practitioner was great. After having been brutally tortured and abused for so long, and when she faced death, she could firmly shout out these words. In front of the practitioner's steadfastness, Ms. Yang thought that she had no heart to think about the practitioner's attachments. Since then, when Ms. Yang saw or read about the persecution of practitioners, she would remind herself that the practitioners have their glorious aspects that others are unable to see, so she should support their righteous factors with her righteous thoughts. Ms. Zhang participated in ticket sales for Shen Yun performances three times in Berlin. During the process, she saw her attachment to the position of coordinating the ticket sales. Behind this were her attachments to reputation and gain. She wanted others to think that she was important and capable, behind which she found the attachments to showing off and competitiveness. After having detected her attachments, she thought she would not mind what she was assigned to do. Everything is important in preparing for a Shen Yun performance. When cooperating with an elderly practitioner, Ms. Zhang also realized that she was unable to look at problems from others' viewpoint, she lacked tolerance and compassion, so she was impatient, and was unable to discuss with the practitioner peacefully, causing a lot of obstacles to their work. After the conference, many practitioners said that the speakers shared new insights on looking within and unconditional cooperation. They have found many of their own shortcomings from the Fa conference, which also inspired them to be more diligent. Practitioners from Germany Respectfully Wish Revered Master Happy New Year!